You and your dog have just returned from the veterinarian after receiving the dreaded diagnosis: cancer. Along with the panic and heartbreak, you try to focus on what’s ahead as the battle against this often deadly disease begins. Your veterinarian most likely will refer you to a cancer specialist. 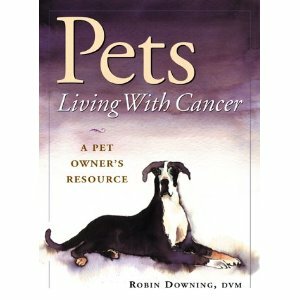 Whether you work with a single veterinarian or a team set up to help you and your pet deal with this medical condition, Robin Downing’s book, Pets Living with Cancer: A Pet Owner’s Resource, is a wealth of information to guide the decision-making process. Whether you have just been given the diagnosis or have been dealing with the disease for some time, her book can help answer many questions you may have. It serves as an excellent guide, covering not only the diagnosis, but treatment options, hospice care, and euthanasia. Downing, a DVM with her own practice in Windsor, Colorado, brings both a professional and personal approach to a difficult and terrifying situation by including the story of Murphy, her big, beautiful Great Dane. Murphy has survived three years following a diagnosis of osteosarcoma and even participated in the American Cancer Society’s Relay for Life Survivor’s Lap in Ft. Collins last June. In addition to explaining the different methods of diagnosis, Downing also discusses such treatment options as surgery, chemotherapy, radiation, and alternative therapies. She explains that cancer is usually treated with a multi-therapy approach, which appears to be the most effective method when battling this disease. Regardless of the treatment path you choose for your pet, this book will be helpful. Because cancer and its various treatments all take a toll on the body, nutrition is a very important part of every therapy program. The book explains how food and the proper diet help treat the cancer patient. Downing also provides guidelines to aid in a variety of difficult situations which can occur during the treatment and remission process. Addressing head-on that most difficult of choices, Downing explains hospice care for pets and sympathetically helps you determine when the time has come for euthanasia. Resources such as books, web sites and phone numbers for veterinary teaching hospitals around the United States are also included. While we all hope never to have to deal with cancer in our beloved dogs, having this book can help ease our worries and guide us to the best path through this difficult passage. Ed. note: Robin Downing’s Great Dane’s osteosarcoma survival story can be found in “Dogs of Hope: Long-term Osteosarcoma Survivor” in the medical sections of this website.